When Joseph got his autism diagnosis at the age of two, they might as well have diagnosed me with anxiety at the same time. Anxiety has become such a habit for me that I now have what I call an anxiety slot. It seems that this anxiety slot needs to always have something in it, so if Joseph’s situation isn’t making me anxious, my mind easily puts something else in the slot. But the spiritual path is a path of increasing awareness. The call is to look intently into the mirror of one’s consciousness and not shy away from the blemishes. So, yes, I have developed the habit of anxiety. And now it seems like the time to work on it. I can see my new yoga series: Yoga for Anxiety. It’d be a big hit, don’t you think? That being said, we are experiencing some wonderful breakthroughs with Joseph! Blue Eyes took him to New Zealand (Blue Eyes’ native land) for two weeks in October, and I stayed home. Joseph came back with a deeper bond with his father, a new openness for adventure, and an appreciation for his extended family. This was great, coming on the heels of Thanksgiving, where we recently gathered at my brother’s house with about thirty of his American relatives. Joseph was excited to go — amazing in itself, given that he’s dreaded past gatherings. And he had fun! Joseph needed the constant scaffolding of being with Blue Eyes or me, but our RDI Consultant assures us that many of his kids would be happy wandering about in their own world, not needing anyone. So this was a good thing. Joseph’s need for us included emotional comfort and perspective-borrowing — a wonderful thing for a child with autism to look for from people! It was interesting to look at the impact Joseph makes on my larger family. He reaches into people’s hearts and, simply by his very being, he helps them to open. He’s been doing that to me for years. There’s something so special about connecting with an autistic child. Back on the home front, Joseph’s figured out a way to tease Blue Eyes so that he gets chased all over the house. Once he is caught, he is tickled. This can go on for hours. Joseph can’t wait for Blue Eyes to get home in the evenings so that they can play this game. In the past, Blue Eyes has been pretty much ignored, and now Blue Eyes says it’s actually fun to come home from work. The happiness in our house is palatable. Wow. Connections have been happening, more than ever. I love shared things! Shared smiles. Shared emotions. Shared conversations. Shared snuggles. Precious, precious times. I have been wondering what the flip side of anxiety is. Contentment? Faith? Trust? Surrender? For me, in this journey with Joseph, it seems to be hope. I used to hope for recovery, and then I shut down around that and stopped hoping pretty much altogether. Now I want to cultivate hope again. I hope for continued intimacy, continued growth, and continued breakthroughs. It’s been said that many of the great achievements of the world were accomplished by tired, discouraged — and, may I add, anxious — people who kept on working. That is a really good adage for us autism parents. The thing about hope is that it’s a risk. To hope is to risk pain. But to live a life fully open and fully lived, we must risk. We must hope. We must continue on. And every now and then we get some sweet, blessed, blessed encouragement. Yea. Wishing you strength, courage, and hope on your journey. Joseph got sick this past week: cough, fever, ear infections — the works. It started on Christmas evening, shortly after we’d gotten to a friend’s house for dinner. Joseph had a major meltdown, claiming he was sick and needing to go home. Devoted mother that I am, I didn’t believe him. I thought, This kid has autism; he doesn’t like unfamiliar situations; he is just making excuses to get away. We sat for a long time in the sewing room, Joseph crying and pleading, me trying to get him out of his unhappy mood. Eventually Blue Eyes came in and ended the stand-off, pointing out to me that, sick or not, Joseph was not in the space to be at a gathering. The family kindly packed us Christmas dinner to go, and home we went. Sigh. Merry Christmas. We all regress somewhat when we’re sick, don’t you think? It sure happens in my family: Blue Eyes crawls into bed and doesn’t come out until he’s well, and I get mopey and weepy. Joseph’s form of regression is different: he retreats into more autistic behavior. We’ve seen this time and time again so it’s not frightening, but neither is it any fun. I’d forgotten what it was like to ask him questions multiple times, or to call his name, and not have him respond in any way. I’m so glad that phase is over in our non-sick lives. Long before Joseph’s time, when my niece was 18 months old, she taught me to play the chase game. I imagine there is a variation of this game in every culture; in our case Madison would look invitingly at me over her shoulder and then start to run. When I took up the chase, chanting, “I’m gonna get you!” she’d run faster, almost falling over from giggling. I’d catch her and tickle her, and then we’d do it all over again. And again. And again. I expected to have the same fun with Joseph but, alas, it didn’t happen. That laughing invitation, that teasing “come join me” look, is not exactly an autism staple. The autism attitude is more like, “Leave me alone; who needs you?” Autism touches every aspect of a person’s life, including play interaction. Still, Joseph has, slowly but surely, started to understand the chase game. About six months ago he started chasing me in earnest (well, earnest fun), up the stairs, down the stairs, outside, inside, laughing all the way. He wasn’t so good about being chased, however: When I’d try, he’d run a short ways and then, no longer interested, stop. Game over. We are enjoying amazingly warm, sunny weather for wintertime. After a week of sickness and regression, Joseph was finally well enough to get outside and enjoy it. We celebrated by going on one of our favorite hikes, through oaks and madrones, with river views and a waterfall as the final destination. Joseph began the hike by saying, “Mom, chase me!” and running off ahead. Then he called, “Dad, you chase me, too. Both of you — chase me!” Blue Eyes took off after him, and for the first time Joseph ran from him, far and fast. Then he called to us again. This time I caught up and tagged him. Without any clarification from me, he took off after me, running until I was tagged. Oh joy. Parents, if this is something you take for granted around your child, please don’t. It’s someone wanting you to play with them and being able to communicate that fact, even persistently enough to bug you for it. It’s your child knowing how nice it is to share an experience rather than to go it alone. It’s someone understanding a pattern: run, get tagged, chase, tag. In other words, it’s good stuff. Important stuff. Ever since conquering the monkey bars we’ve been on an upswing. Oh, we’re still dealing with public screaming and various other autism unpleasantries, but in general the trend is our friend. Lots of good firsts happening. This sums up how I’m feeling about this new phase. There are a bunch of little miracles happening, step by step. When I see the laughing invitation in Joseph’s eyes, the reaching out for the company of his parents and friends, the willingness to stick with interactions and play more fully — oh! I feel that incredible something there, just waiting to be known. What is that something? I think — no, I know — it’s more of Joseph. More of who he really is, when the autism isn’t in the way. More and more Joseph is emerging, unhindered. That, my friends, is my something incredible, and I will take it over anything else this old world has to offer. YM: We’re worried about Joseph’s school concert. Last year, Joseph stood on stage and flapped his hands like a wild man. The other kids sang and did motions to the songs, and Joseph flapped. He never sang, not even once. He looked soooo autistic. John: Tell me more about the flapping. Was he nervous up on stage? YM: Not at all. He knew we didn’t want him to flap. He looked us in the eye, grinned a wicked grin, and started flapping. John: Ah! So he was doing it to bother you guys. Sounds like a typical kid to me. YM: We’re thinking to let him do the dress rehearsal and call it done. What do you think? John: I say, don’t leave out this experience for Joseph just because you and Blue Eyes will be uncomfortable. Experiences like this are really valuable for him. If you guys can live with the discomfort, I think he should do it. Sigh. Sometimes you have to use the psychic Samurai sword to slash away your own wishes and do something for your kid’s growth. We spoke to Joseph’s teacher about our concerns, and she got the whole music team on board to brainstorm. They ended up putting an egg shaker in his hand. At the concert on Tuesday night Joseph was busy keeping the beat, and sometimes he even sang. No flapping; not even one little wriggle of the hand. Have you ever noticed that, if you’re willing to be uncomfortable, you will often be excused from the actual dreaded experience? The concert was therefore, in our eyes, a huge success. And that wasn’t the only high note of the week. Joseph has a crush on a girl in his class named Fiona. He sure knows how to pick ’em — she is a cutie. On Monday Fiona came over for her first playdate. When Joseph was maybe four years old and I was trying to interact with him, we’d play this game where he’d run into his room and slam the door shut. I’d bang on the door, protesting, and he’d laugh like crazy. This was called “interaction” at that phase of his development. The trouble was, when potential friends came to play, Joseph would do the same thing to them, expecting them to come bang on the door. But, of course, no one ever knew they were supposed to do that. And Joseph wondered why they didn’t. It was puzzling on all sides. I resigned myself a while ago to the fact that I might always be a part of Joseph’s playdates, because he may not be capable of coming up with things to do with a friend, or of even remembering to include the person in his activities. It was different with Fiona. They ran down to the play structure and, well, played. After a while they came back for snack. 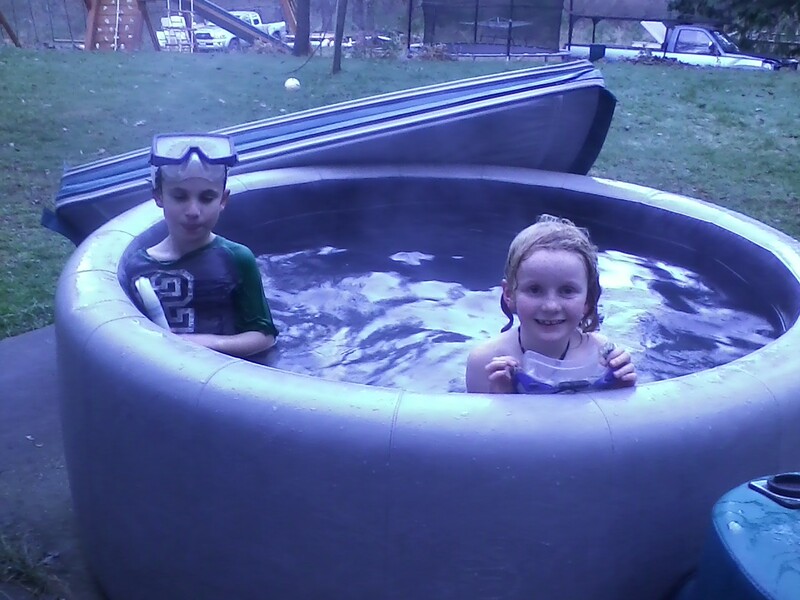 Then they went into the hot tub and played some more. When it was time for Fiona to leave, she was sad. She’d had such a good time. Playdate #2 took place on Wednesday and consisted of John’s two boys. John was blown away at how Joseph took the initiative, suggesting they kick a ball around together and then play some musical instruments. They went to a store together and Joseph clowned around trying to climb into a mini-refrigerator, to the amusement of some customers. John was overwhelmingly enthusiastic about Joseph’s progress. Best friend??? Be still, my beating heart. John has recently graduated a girl from the RDI program, pronouncing her recovered. She has friends seeking out her company. She is understanding subtle social nuances. This is a huge deal. Our regional agency, the one that funds interventions, told John that they’ve never had one of their kids come so far. They want to make this girl their poster child for what intervention can do. I try not to fan it, but having had a week like this one, and hearing John’s enthusiasm for Joseph’s part in the play date, and knowing that it’s possible because it happened to someone else, the quiet flame in my heart that whispers, “Maybe Joseph could recover” is burning a little more brightly just now. Sometimes I get a glimpse of what Joseph would be like fully recovered. 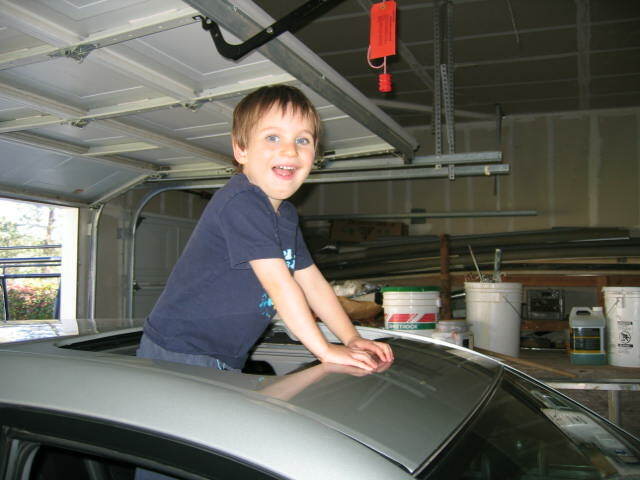 He’s such a neat kid with autism that I can only imagine how amazing he’d be without it. With the ability to process more easily, to communicate more fully, to interact more deeply. Trying to breathe and be present. To be okay no matter what. And, really, I am. But that doesn’t mean I don’t hope. Because I do. Most of the time I’m not even aware of the quiet, hopeful flame in my heart anymore. But it burns steadily on, through rough times and regular times and amazing times, and I appreciate that. May the flame in your heart, whatever it burns for, rise up and warm you during this holiday season. I am on a liver cleanse. I’ve done this same cleanse every year or two for the last decade, but it seems I always forget the hard part until I’m in it again. A long time ago, I was in the habit of using food in a very destructive manner. Then I enrolled in Overeaters Anonymous, went to therapy, faced many demons, worked the 12 steps hard and, with a lot of help, made my way out. So why is this cleanse so difficult? Because I still use food to go unconscious, but in small ways — it doesn’t run my life the way it used to. 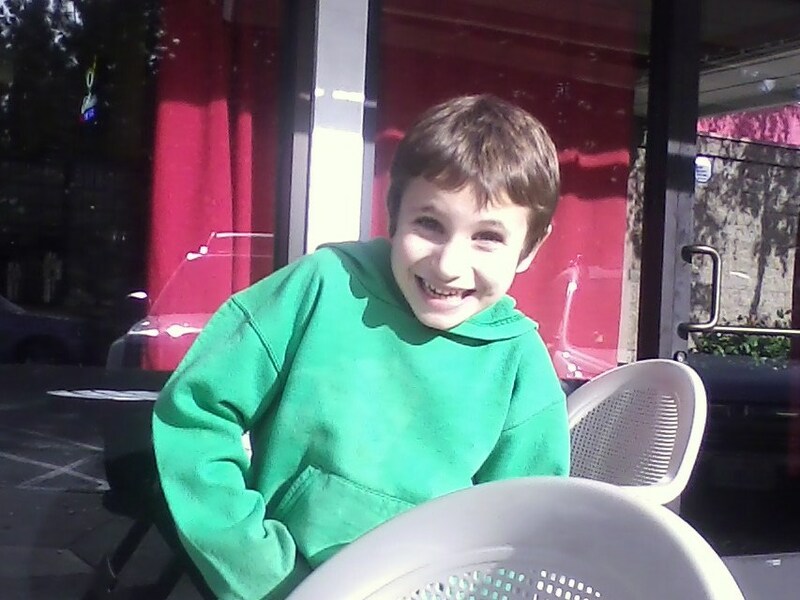 Getting very conscious about my food — and, therefore, about my child with autism and my life itself — is challenging. And my body hurts. I feel like one big, toxic mass. But you know what? I’m going to stick it out. This is a four-week cleanse and I am on day four — which, though difficult, is nevertheless easier than day three was. The part of me that wants to grow, that wants to be conscious, is delighted. I get to work on self-control. I get to give it to God instead of diving for the object that alleviates my awareness. I get to witness the grasping mind wanting so badly to grasp. Do you remember that movie, Airplane? As things go from bad to worse, the pilot keeps saying things like, “Guess this was a bad day to give up alcohol,” as he downs a drink. Later it’s, “Guess this was a bad day to give up heroin,” as he shoots up. That’s what my mind wants to do. Guess it’s a bad day to give up unhealthy food. Ha! Not a chance, mind. This thing is bigger than both of us. What I’d like to do in my life is focus not so much on my problems. I want to focus instead on God and the amazing grace of his/her presence in my life. Instead of the problem of autism, I want to focus on the power and profundity of parenting a child with autism…of how it’s changing me. I gave a talk to a mothers’ group last week. I spoke with them about authenticity. I shared my challenges about raising a son with autism and I invited them to speak authentically. It was beautiful. Lots of tears, plenty of laughter. For days afterward, in my own little life, I felt the cords of connection between me and these women I’d never met before — but who met me on such a deep level. I was only able to be so real with them because of where this journey with Joseph has brought me. It has brought complete havoc on the person I was. It has cracked the cracks and removed the mask and brought me to my knees — which, I might add, is not a bad place to be. So I think I’ll just stay here on my knees. Knowing God’s depth-less love for me, for Joseph, for every single one of us. Knowing that there is a plan — a soul agreement — around this journey, even if I can’t see it. Trusting that God will guide me to the next step I am to take — and that this is all I need in this moment. Meeting God where I am, toxic mass and all. Courage. To one and to all. I love our meditation group. Every Tuesday night, friends — old and new — come over to join in meditation together. We started it a year ago and it was a huge stretch, given that we were exhausted physically, mentally and spiritually from our journey with Joseph. One of the biggest obstacles was that I didn’t feel I had the energy to get the house clean every week — much less have any spiritual clarity or inspiration to share. But here’s the thing: it wanted to happen. So I got out of the way and let it happen. Now I find that it’s easy to keep the house up. Instead of having to clean for three hours because we invited friends over, I just run the vacuum cleaner over the rug and say, “Come on over!” A kept-up house is an easy house to keep up. Wish I’d discovered that years ago! And the energy has come. At first we were simply exhausted every Tuesday night. But something’s shifted in the last year, and now all three of us look forward — with energy — to sharing our Tuesday nights with fellow devotees. 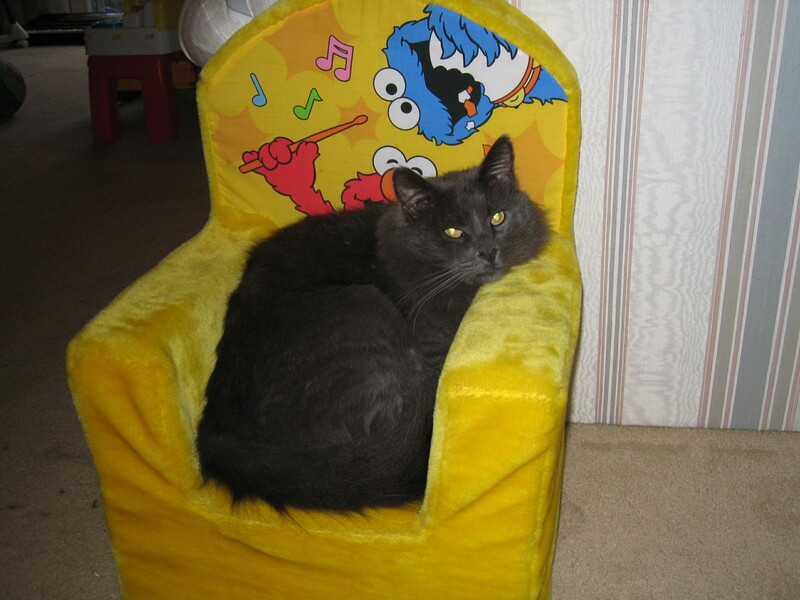 This last Tuesday, I got inspired by a loyal member of our meditation group: our cat, Ollie. Ollie, like all members of his species, has perfected the art of deep relaxation, and this is what he was practicing while the rest of us meditated. At some point I heard him heave a deep SIGH of contentment — the kind of sound you make when you’re slipping even more deeply into rest, when you’re surrendering perfectly. I immediately imitated Ollie, heaving a deep SIGH and just letting go into the Light. More and more in my meditations there is a part where I simply rest in God, and Ollie providentially reminded me to do that. It was, in a word, Divine. Sweet rest. Sweet letting go. Sweet, sweet surrender. I am remembering to lay down my burdens and be who I truly am: a child of God. I lay my head in Divine Mother’s lap and allow her to cradle me. It nourishes me on a deep level. I’ve been thinking about the concept of holding lately. We hold others in prayer; we hold them in our thoughts; we hold them in our hearts; we hold them in the Light. A lot of people have held me in the last four years, since getting the autism diagnosis. Some were old friends, some were family; some were new people who showed up, I believe — professionals and new friends — just to hold us through our struggles. It’s been so intense. Words cannot express. Sometimes life hits you so hard that you can’t stand up by yourself. I never could have made it without being held. I am eternally grateful to those who did the holding — and to God, who held me up through them. I listened to a pastor speak recently. He told about a dreadful tragedy that befell him where he and his beloved wife got into a car accident. She was killed. He went in and out of consciousness, but finally woke up for real in the hospital. At that point he was told about his wife’s death. The pastor said that the first thing he realized was that, as tragic as the situation was, God was in it. And that this God was the same God that had been there before the accident. So powerful. And so true of all of it — the whole journey — mine, yours, everybody’s. God is in it. This is what I held onto when it took all my strength to get out of bed in the mornings. This is what kept me going when I felt so hopeless about Joseph. This is the concept I clung to even when I didn’t feel its truth anywhere near me. Now, with Joseph making almost daily progress, with sleep happening for him and for me, with a beautiful, supportive group of people to meditate with, I feel grateful. And humble. What a life. What a journey. Thank you, God, for being in it. Then he drew something else and said it again. And so it’s continued for the last few days. So something is changing. Some new neural pathways are forming, new synapses are firing. Something, somewhere is developing. It’s exciting. It’s great. It’s — wow — very, very encouraging. And I think that maybe, perhaps, possibly even probably, he always will. He may always have some funny, jerky movements. He may always have a more challenging time with interpersonal relationships. He may always have a not-so-good sense of what’s appropriate and what’s not in social situations. But I also think that maybe, perhaps, possibly even probably, he’s going to make it in this world. Joseph just seems to draw people who are good, kind and loving. Whether it’s teachers (this means you, M.P. ), sitters, or friends — both big and small — people love his good, kind, simple and innocent heart. He’s a bit like Forrest Gump in that way — but more mentally switched on, thank God. I’ve been listening to a talk that Dr. Temple Grandin gave at the MIND Institute (http://www.youtube.com/watch?v=2wt1IY3ffoU). She is able to talk about her autism in a way that allows us ‘others’ to understand it better. She talks about a book she co-authored with another autistic person. He was more switched-on socially, so that was a bit difficult for them, but they both were obsessed with school buses, so that was cool. I love the way she is able to laugh at herself. Autism has given her a different perspective than the “normal” person, and she has used this to carve out a unique and rewarding life. She offers hope — and ideas — for ways that people with autism can work, and live, and function in this world. Maybe it’s not about making Joseph “normal.” Maybe it’s about helping him to do what we are all learning to do: manage our weaknesses and foster our strengths. Maybe diversity isn’t so bad. I went to elementary school with an albino boy. He had white hair, always sat in the front row, wore very thick glasses and used a typewriter. 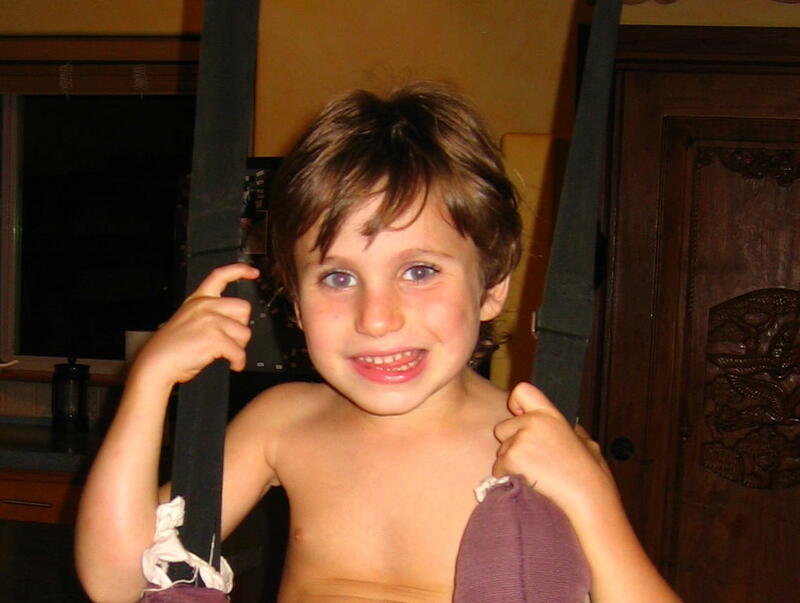 He was also bright and funny, and, while we were fascinated with how he was different, we also loved him for who he was. We “got” him, in today’s vernacular. So I think I’m going to stop acting apologetic about Joseph’s funny movements and lack of social graces. We will continue to help him grow in all ways, but we will also open more to the gifts of what we have. When Joseph says, “Mom, look at this!” I want to remember that it’s not just “this” he is asking me to look at. He is also asking me to look at him — to see the beauty of his being, to be a part of his world. He wants me — and all the rest of us — to “get” him. Sharing his world. I think that maybe, perhaps, possibly even probably, it doesn’t get any better than that. I grew up in a determinedly non-religious, Jewish family. I believe that I always felt God’s whispers in my heart, but I didn’t know what to do with them. In my college years, as I experimented with various drugs, my longing began to emerge more fully. How I wanted a spiritual teacher. I remember one night, looking up into the stars, beseeching the heavens for that person who would teach me about spiritual matters, who would help me to know God. That was the first time I ever got an answer from the Universe. It was: wait. I was both terribly depressed and absolutely thrilled that Someone, Something had responded to my call. And I waited. And I watched. When I finally found that my path was an inner one of meditation and a more universal view of God, I dove in headfirst. Things were rosy and exciting. Many times I felt God’s quiet, inner presence guiding me or loving me. And I loved her back. Then I got an email from my best childhood friend. Her brother, Daniel Pearl, was the reporter from the Wall Street Journal who was kidnapped in Afghanistan. The Pearls had taught me all I knew about the Jewish religion and our families had been very close for a while. I had watched while the Pearl children went to Hebrew school. I celebrated Passover and Sabbath with them. They are exceptional, talented people who live their lives with integrity. If I do everything right, God will leave me alone. Leave me alone in the respect that He won’t do anything horrible to me, in that tragedy won’t touch my life too terribly. But when I saw what happened to the Pearls, knowing that they “did everything right,” I realized that the game was much bigger than I thought. So, I asked myself, why do I even try to connect with God if she won’t take care of me, won’t play nice with me? Ultimately I came to the fact that I am a part of God. I cannot separate from him no matter how he treats me, and I will always want to connect more deeply for the same reason a wave always melts back into the sea. We are one. But this God figure is tough. She is not only awesome; she is awful. It is the awful grace of God that one runs into in one’s life, once or twice or more often – depending on what kind of lifetime you’re having. The Goddess Kali, from the Hindu tradition, personifies this tough aspect of God. Ma Kali is a black-skinned Goddess who wears a garland made of 52 skulls and a skirt made of dismembered arms. In two of Her hands, She holds a sword and a freshly severed head that is dripping blood. She can appear to be wrathful and terrifying. I knew an Indian man who was an ardent follower of God as Kali. He prayed to her constantly, worshipped her daily, constantly asked her to appear to him. For around 25 years he never stopped asking to see her in form. He longed, he wept, he pleaded to see her for himself. Well, one day as he was praying he looked up, and there she was. Do you know what he did when the object of all that longing was finally there, right in front of him? He screamed in terror and ran. The Goddess Kali can do this to people. Since autism entered my life, I have felt Kali as a constant companion. Her ferociousness has blown me away. Her willingness to sever my ego is enough to make me scream with pain. And yet. 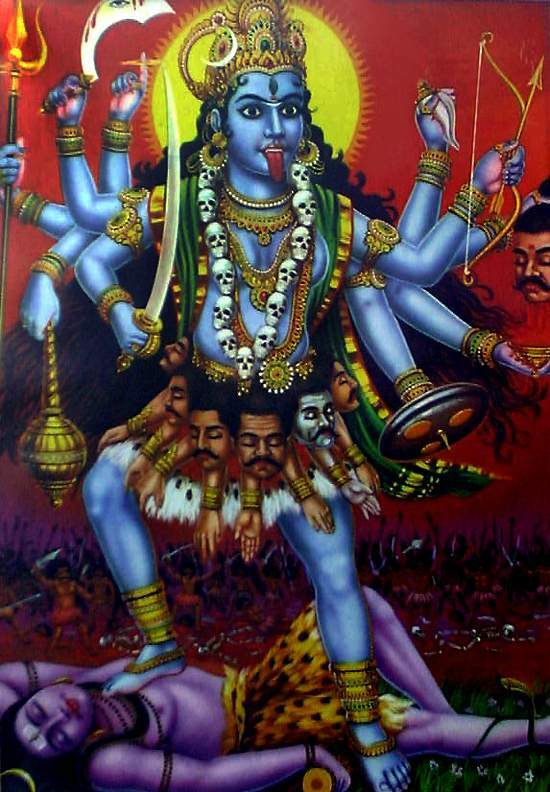 Kali is said to be a most compassionate mother because she provides moksha, or liberation, to her children. She is the destroyer of unreality. When the ego sees Kali it trembles with fear because the ego sees in her its own eventual demise. Underneath all the scary parts of Kali is the loving Mother, who is sweet, affectionate, and overflowing with incomprehensible love for Her children. At this point in the autism journey, I can see both these sides of Kali. I am amazed at how surgically precise she is at removing my illusions, and how willing she is to do so — without anesthesia, I might add — for my own good. But I am not so scared of her anymore. A few years wrassling with one’s opponent can build up, perhaps not friendship, but most certainly respect. Mostly now I feel her when, for example, the pangs of wanting a neurotypical kid get strong – when I feel I missed out on most of the fun of raising a child. I hear her laugh when I indulge in self-pity. And I have come to trust her. God, in the form of Kali, is tough. The epitome of tough Love, if you will. But fire, while searing, is also purifying. Sometimes now, in that roaring fire, I will feel her love. I will know that the Mother is with me, tenderly looking out for my highest spiritual potential. So, I have learned, it’s most certainly not about doing everything right in order to avoid the Big Lessons from the Big Guy. What a relief to give up on that one. It’s about learning to surrender into that which is hammering at you, learning to see with clarity beyond the illusions in front of you — and, most importantly, to really, really know that it’s all being done out of Love. We came from Love, we will go back to Love, and Love is here and now, always, always. In my journey, it’s required tough love to bring on an experience of true love. Such is the dance of spirituality and autism. Joseph is doing some quantum leaps at the moment. The way we can most see it is in his drawing. You see, his coloring has been mostly squiggles and blobs and blurs, which he has interpreted as trains or thunder or some other objects. But the other day, in preschool, his amazing teacher taught him how to draw faces. She got a mirror out so that he could look at his own face, and she had him look at hers as well. They figured out together that there are two eyes toward the top, a nose in the middle, and a mouth underneath. And now Joseph draws face after face, with bodies, legs and feet, too! It’s an exciting step in development. One of my friends, who hadn’t seen him in perhaps a month, couldn’t believe the changes when she saw him yesterday. So hurray! for progress. We were driving home from the store the other day when Joseph said, “There’s another silver Matrix!” Sure enough, right in front of us was the exact same make, model and color car that we drive. I started waxing philosophically to Blue Eyes. Maybe that’s me in a parallel universe, I said. Maybe that me has a neurotypical kid. I wonder how she is different from this me? So, Yoga Mother with the neurotypical child, how are we different? Have you had to learn patience as well as I have, repeating the simplest thing endlessly in the hopes that your child will one day grasp it? Have you tasted the humility of your child being different, being disabled, of your child (and, therefore, you) not fitting in when you’ve desperately wanted him (and you) to? What is it like to not have been imprisoned in walls of isolation — walls we are only now really breaking out of? Most importantly, other Yoga Mother, I want to know what your spiritual life is like. Have you experienced drowning in your own delusion — in stress, anxiety, hopelessness — the way I have? Have you ultimately come to the knowing that God gives it all to us — that S/He weighs it out, measures it, makes sure it’s just right, and then sends it along — even if we never really understand why? I think, other Yoga Mother, that the spiritual difference is probably the greatest difference between us. It’s not that you aren’t spiritual; it is the most important part of your life. But you haven’t been tested the way I have, and so you haven’t been forced to dig more deeply than you ever thought possible. You haven’t been broken open the way I have, so you haven’t experienced the same magnitude of comfort, grace, and simply the presence of Almighty Spirit with you every infinitesimal step of the way. Would I trade with you, Yoga Mother of a neurotypical child? Yes. No. In a minute. Never. I have a friend who has recently turned 60. She says that, when you look back from that vantage point, everything that’s happened makes sense. She’s had some whopping challenges in her life — so, coming from her, this was no light observance. And that is where I end today’s post: with trust. Trust that this journey is my journey. I wasn’t meant to be in that other silver Matrix. This road may have some incredible bumps, but it’s my road, my journey. So I bless you, other Yoga Mother, and let you go your way while I, with trust, an open heart, and the grace of feeling God all around me, go mine. We’ve been back from Maui for two days now. We came home, packed away our shorts and tank tops, and put on our long underwear. Yesterday evening we watched the first snowfall of the winter turn our yard white. It was pretty. But just for these few moments, I ask to you join me once again in lovely, warm Maui, where the breezes blow such soft sweetness into your mind that you are unable to hold even the slightest of grumpy thoughts for more than a moment. My last post had Joseph and me hanging out together at an expensive resort. After our healing time in the hotel room, we sauntered back out to the pool. This time it was a little easier for both of us. I stopped wishing that Joseph would just relax and enjoy himself like the other kids, for God’s sake, and he stopped — what? Feeling my resistance and reacting to it? Being as scared because he’d already gone to the pools once? But it still wasn’t easy. In particular, there was a water slide in the pool — an easy, gentle one — that had Joseph scared to death. He’d watch smaller kids shoot down it — he’d stand there, watching, for long periods of time — but he couldn’t go down himself. I forced it once by pulling him on my lap and taking him down with me, but he screamed bloody murder and I got those looks from the other parents: Stupid mother! Abusive, uncaring woman! And I gave it up. Eventually we got into the hot tub and Joseph got a little more courageous, swimming by himself small distances and just having fun. It wasn’t long before Blue Eyes joined us. Then evening fell and we watched a magical Hawaiian ceremony that Joseph still talks about. But here’s the thing: when we left the resort, he was still scared of the pool, scared of the little slide in the pool — just…scared. One of the ways autism can present is in this kind of fear. There’s some evidence showing that the primitive part of their brains is not as well connected to the rational part, so all that primal fear comes up unabated. I’d say that, in Joseph’s case, this is probably true. This fear presented strongly around the ocean, too. Joseph was very afraid of going in past his ankles But one day I just forced it…gently. I scooped him up and carried him into the water, holding him tight and trying to make it fun. He actually enjoyed it for a bit. Blue Eyes saw it happen and took up the theme, giving Joseph a piggy-back ride right into the ocean. When Joseph protested I showed up behind him, wrapping my arms around him and pronouncing him a Joseph sandwich. Somehow this made him feel safe, and he actually enjoyed being in the ocean for quite some time. Then, RDI style, we very consciously spotlighted what had happened, showing Joseph how far out he’d been in the water and how well he’d done. We even took a photo so that we could remind him with a visual once we got home. 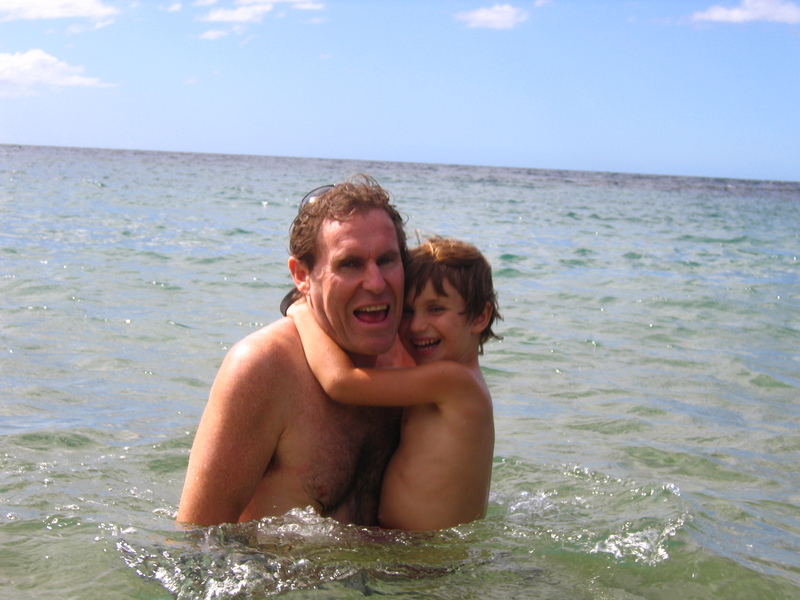 In subsequent visits to the beach, we progressed to Joseph doing some assisted swimming from me to Blue Eyes and back. And when he was on his own, he’d venture in waist-deep. Everyone felt more competent. Being more confident in the ocean must have felt so good to Joseph. Before that I would watch him watching the other kids in the water, quite a few younger than him, and I know that somewhere, perhaps not even verbalized into thought, he was wondering what was wrong with him that he couldn’t get into the ocean like that. A few days before we were to come back home, Joseph started talking about the resort pool again. He said he wanted to go back; he wanted to go down the slide; he wanted to put his head under the water this time. It looked like we didn’t have time to do this, and then a little Divine Choreography occurred: the people we were house sitting for called. They were delayed; could we stay an extra day? Thank you, yes. So, on our last full day in Maui, we drove the long drive to Lahaina and snuck into the resort’s pools. Normally Blue Eyes and I have a lot of integrity. Normally we would not use a hotel’s facilities without paying for them. But our son’s special needs make us bold sometimes. He seemed to need closure on his fears, and we were curious to see what would happen. We wanted to help him. So in we snuck. Joseph got onto a boogie board and swam around the entire lagoon twice. Then he went to his nemesis: the slide. He sent his boat down. He outright refused to go down on my lap. He sat at the top of the slide and, making sure that Dad was at the bottom should anything go awry, he slowly let go. Many times. He conquered that damn slide. Then he put his head under the water. Then he swam on his own a fair distance. When we left those pools (having constantly dodged the lady with the clipboard who was throwing non-guests out), we had by our side a competent, satisfied child. Today was Joseph’s first day back at preschool. His teacher couldn’t believe it: Joseph used to have a paralyzing fear about going sledding down the long hill at the school. But this time he sat in the front and rode the whole way, twice, having the time of his life. The moral? Never give up on your kid. Things may take longer than they do for typical kids — heck, they may not even happen in this lifetime — but when you run out of patience, remember that you can draw on the boundless patience of our Divine Mother/Father. Most importantly, no matter what the obstacles may be, do everything you can to help your kid feel competent. That way, the (shudder) free-fall of incompetency and fear can be replaced by riding high on an upward spiral of competence and confidence. After all these amazing leaps in development, in the last few days Joseph seems to have taken a horrifying, frightening, quantum leap backwards. We are seeing behaviors that we haven’t seen in so long we’d almost forgotten them: weird tracking with the eyes, autistic-like movements, shying away from other kids, a decrease in vocabulary. This morning was the worst. He just screamed and screamed. It was as if he were in some inner pain or turmoil, but he couldn’t possibly communicate about it to us. Note to self: Breathe. Don’t panic. Resilience, resilience, resilience. My RDI consultant seemed to talk about resilience incessantly when we first got on board. I didn’t really know what she was talking about, so I’d nod and let her go on without paying too much attention. I was focused on trying to survive the torture of sleep deprivation and get a grip on what autism was. Who had time to worry about the concept of resilience? It is my observation that survival comes before resilience on the life pyramid. But as the survival part came more into balance, the concept of resilience started to take on some meaning. Joseph, for instance, used to give up all the time. He’d give up on getting people to notice him or play with him, on understanding new concepts, on toys that were a challenge, and on trying new things. He wouldn’t even repeat something when you hadn’t heard and asked him, “What?” He’d given up on communicating after the first round. But I think that, while it’s paramount to develop resilience in autistic children, it is possibly even more important to cultivate it in their parents. In the early days, we’d try to engage Joseph in something and, when he resisted, we’d give up. We didn’t have the energy or the motivation. We were scared of being failures. It was easier not to try. The entire family was drowning in incompetence. No wonder our consultant wouldn’t shut up about resilience! Eventually resilience turned up as one of our RDI objectives. I forget its official title, but the gist of it was that when my kid tried to get my attention, I was to turn away a number of times and he was to persist. We tried and tried with this, to no avail. I will never, ever forget the day it finally clicked. Joseph was trying to get me to make this funny sound back at him. He made it over and over to me, even though I was turned away. When I finally turned to him and made the sound back, he laughed really happily. What was it Churchill said? Never, never, never give up. That goes for spectrum kids and us parents. Our kids need to know we will never give up on them. And yet here are Blue Eyes and me, being stared down by an ugly regression. I have to ask myself, why is failure so bloody easy to give into? After so much encouragement with Joseph’s development, for instance, why is it so tempting right now to give up in despair? It’s just a glitch, Yoga Mom — a tiny blip on the radar. In a week or two, you’ll look back and wonder how you could possibly have let your spirits sink so low yet again. Tell me again, Gordon: to thrive, mature and increase competence in the face of adverse circumstances. In other words, to keep on keeping on. To see life in the longer rhythm – the forest instead of the trees. To focus confidently on where we’re going and, since we’re not sprinting there, to take baby steps in that direction. There is another side to this that must be mentioned. As a fellow minister once said to me, Satan loves it when we don’t ask for help. Now, whether or not you believe in the red man with horns, we can probably all agree that, when things get difficult, there is the temptation to sink down into darkness, depression and despair. And it’s so much easier to do this when we feel isolated. I can pray easily enough, but it is not in my nature to ask another human being for help. In fact, I despise doing it — but this morning I called our naturopath. On a Sunday. And I cried on his voice mail. Just that little phone call, even before he called me back, made me feel so much better. I guess part of the pain is feeling so very alone in all this autism madness. Now it is nighttime. Joseph’s just gone to bed. Something turned for him this afternoon. Clark Kent stepped into the phone booth and, once again, Superman ran out. Suddenly Joseph is once again GREAT — funny, literally slapping my hand away when I tried to help him, coming up with more imaginative play than we’ve ever seen. Let’s make a deal, shall we? Let’s never give up on our kids, and let’s never give up on ourselves. Let’s cultivate strength, courage and faith while it’s easy — so that, when it’s hard, these qualities will see us through. And let’s have the vulnerability, the humility, to reach out to someone else — someone we can lean on when it’s just a little too difficult to stand up all by ourselves. When I was a teenager, I did the est training. I remember that the trainer spoke about the uselessness of hope. To demonstrate, he held up his car keys and said, “Hope that these keys don’t fall.” Then, of course, he dropped his keys to the ground. Hope doesn’t work, does it? I saw the proof with my own eyes. Looking back, I see what a disservice that was to me at such an impressionable time. For many years after that, I didn’t allow myself to hope. When I got consciously onto a spiritual path, I realized how wonderful hope was and I allowed that spark to reside again in my heart. It’s made a huge difference in my happiness quotient. For ASD parents, hope seems so very, very important. What else could keep us going when there are no signs of improvement in our chldren? I believe that hope is the best medicine parents can take in our situation — a direct antidote for the depression that can come along with having a child on the spectrum. 3 1/2 years ago, when Joseph was diagnosed, I had very little hope. I was bone weary and grieving in body, mind and soul. But the human spirit is resilient, and we had the grace of a team of people who held us up as parents and worked with our kid. And now — after years of RDI, biomedical treatment, occupational therapy, blood, sweat, tears and prayers, Joseph is on his way to recovery. I do not say that lightly. I say it with trepidation that the gods will quash me for my audaciousness. But I also am not the only one saying it. Yesterday Joseph’s swim teacher – a tough German lady who stands no nonsense – told me that, in all her years of working with ASD kids, she’s never seen one grow so much so fast. I watched the swim lesson and I saw it, too. She asked, “Whose turn is it?” and Joseph said, “Mine! Mine!” Later she gave him a hard time for jumping in too soon and he argued with her. It was great. And then there was today. Joseph’s preschool teacher pronounced him cured, healed. She said she can’t even talk about mainstreaming him anymore, because there is no special needs kid to mainstream. So, you see? I am not making this up. Joseph has been on Valtrex for ten weeks today, and it has made an amazing change in his life, in our lives. But he had to be ready. It took all those years of helping to heal his gut, of strengthening his immune system — basically of laying the foundation — before Valtrex could step in and do its magic. I know he is doing years’ worth of development in weeks, and I appreciate the raves from his teachers. But I don’t think I can let up yet: We’re not all the way there. We still have crowds and gatherings to work on, pronouns to get right, vocabulary to build up. I also have yet to hear Joseph say, “Mom, look!” You know how some mothers feel they will die happy when their kid gets married? I feel that way about when I’ll hear, “Watch me, Mom!” for the first time. But you know what? I think these things are coming. I hope they are coming. I pray they are coming. Yes, I got hope. And how grateful I am for it: that thing with feathers that perches in my soul.